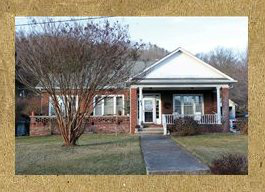 We are conveniently located across from the Spruce Pine Library on Walnut Street, about a block and a half from the corner of Bank of America and Fortner Insurance on Oak Street. My treatment room has both a massage table and a recliner as well as a private bath. Unfortunately, the building is not handicap accessible at this time. Please park behind car in the driveway (a bluegreen Honda CR-V). Since I will be treating you, you won't be blocking me in! If there is already a second vehicle in the driveway, please park to the left side of the sidewalk leading up to the house near the big rock.